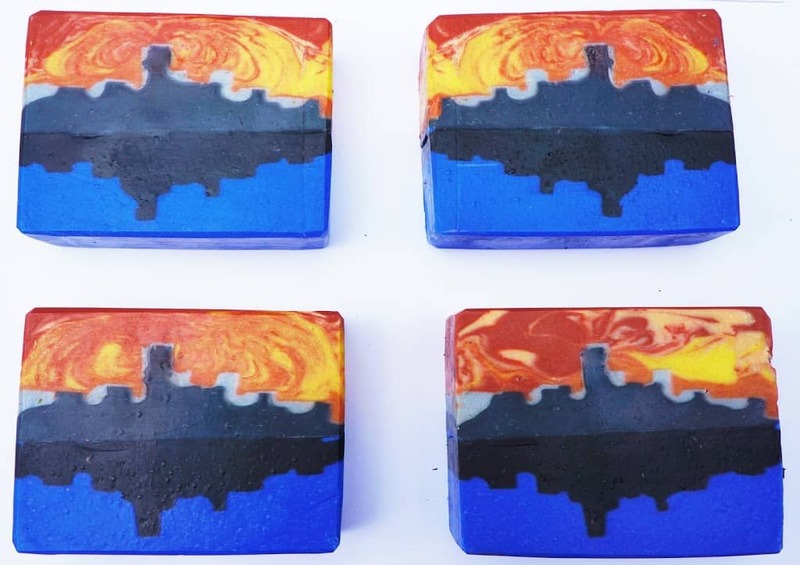 Here is my entry for this month’s soap challenge. We had to cut out templates and use them to sculpt the soap into a layered design. I had a look around for some inspiration and I came up with the idea of a skyline silhouette. I wanted a design where the skyline reflection was mirrored as a reflection in the sea underneath. 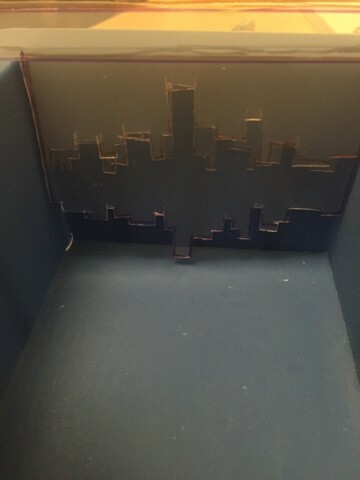 I found a skyline which had a shape that I would be able to replicate. 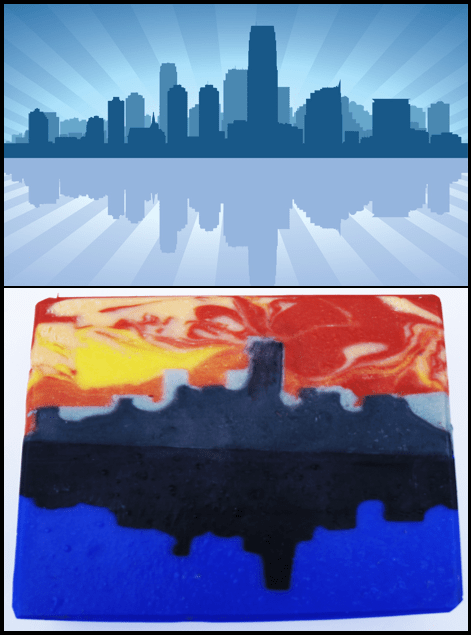 As I needed three sculpted layers for the challenge, I chose to make a layer for the reflection, a layer for the buildings in the foreground and the layer for the buildings in the background. I had a first attempt at this and found that it was much easier to make indented sculptured layers than raised sections as they kept dropping and wouldn’t hold their shape very well which meant the tallest tower sank. 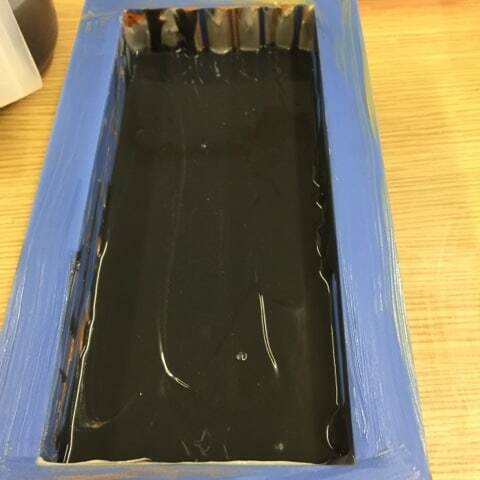 I decided to make the soap in two halves and stick them together with black soap to get the most defined layers. I used clear polypropylene sheets to trace out my design and glued matchsticks onto the back of sections that needed the most stability. 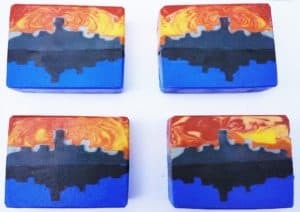 The image above is from my original design, I had to invert and re-cut the pieces for my final soap but I was in a bit of a rush and forgot to photograph the second time around and the pieces after attaching the matchsticks! I made the top half first by pouring the red and orange sky, then creating the pale grey background buildings, then the foreground dark grey buildings. 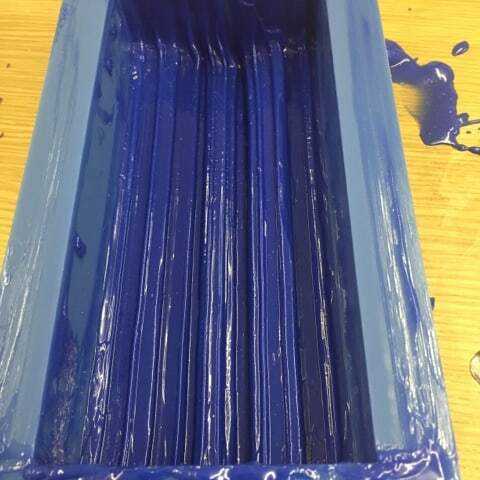 I left this section to set overnight then poured the blue sea layer. 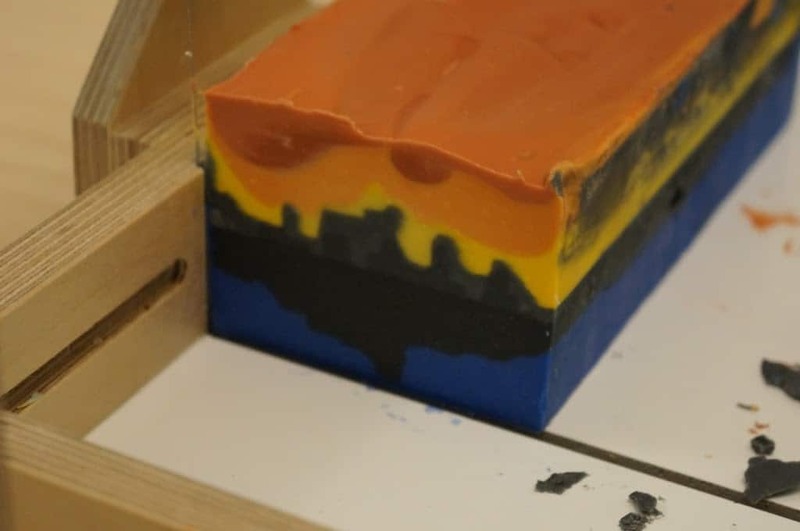 I allowed the black to set up until it was just firm enough to hold the soap I had made the day before. Then I pasted the two together with some more wet black soap. 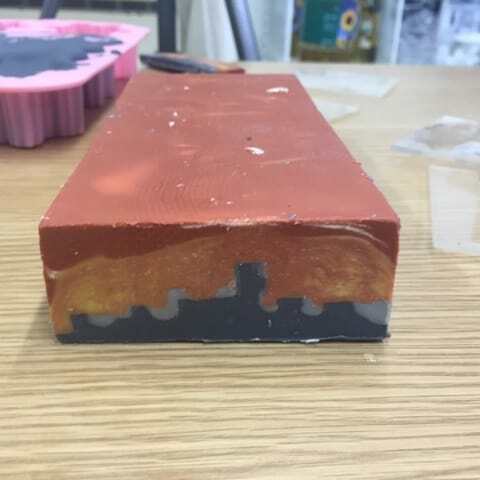 I allowed the block to set overnight and cut the following day. 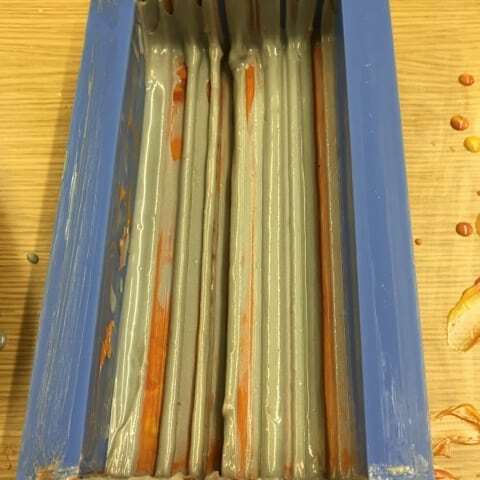 I used a 40% lye concentration for these soaps as it makes nice hard bars that can be unmoulded and cut quickly and I used a fragrance that accelerates a little called cashmere. 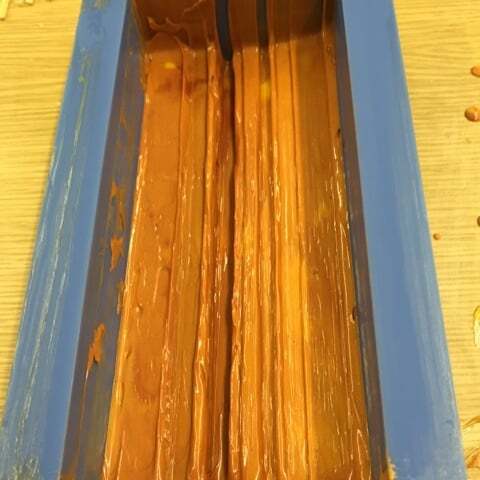 I don’t normally use it for cold process soap as it traces way too quickly. 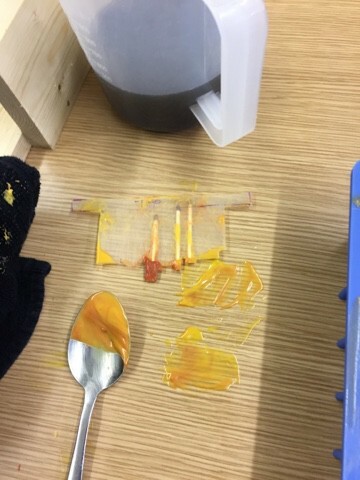 I dropped in a small amount bit by bit into the batter to prevent it accelerating too quickly on me and found that it didn’t trace as quickly as I had wanted or expected. I may try this another time when trying to work with fragrances that move really fast. Here is my first attempt where the upright buildings weren’t as defined as I would have liked and my two shades of grey were too similar to each other. I hope you like my entry. 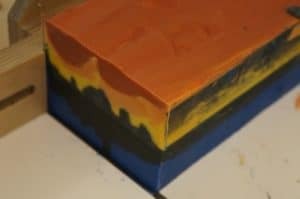 Another really interesting challenge and a technique that I will definitely use in the future! I have also cut out the pieces for another go at this technique. I am going to attempt the Taj Mahal. I was a bit worried that the tower elements would be too thin which is why I concentrated on the skyline for my entry, but I am definitely going to have a try with the other design when I find a spare minute! 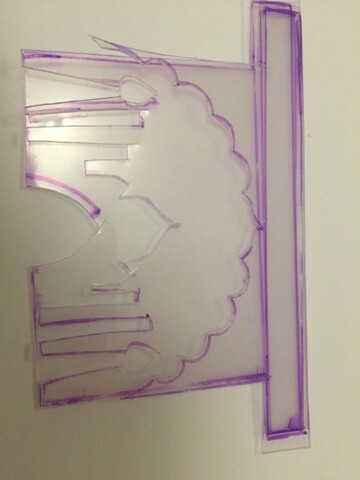 I have included a picture below of the three pieces I have cut out. Thanks to Claudia for sharing and Amy for organising the challenge. Love it, Eva! I was going to do a Taj Majal sunset, too — can't wait to see yours! you accomplished the mirror image beautifully, Claire! And the swirly glowing sky is amazing! I hope you post the Taj Mahal soap—you're really on to something, and it will be amazing, too. This is so cool, Claire!! 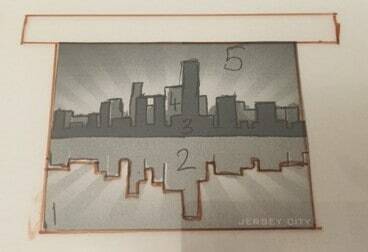 What a great way to get the mirror image of the skyline! Very inventive! It's great when you can take what you learned from your first batch and make it completely successful the second time around. The colors are stunning as well. 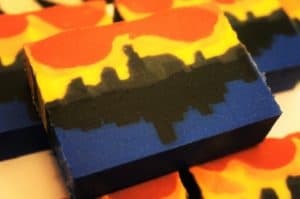 Your cityscape looks great! I am impressed with your patience. That's got a lot of detail in it – love the evening sunset colors and the way you've mirrored it! That reflection is fabulous, Claire, as is the rest of the soap! Very well done! Thanks Amy – this technique is open to so many different possibilities and designs. I wish there were more hours in the day do I could have made more designs. I am definitely going to use this technique in the future! Thank you 🙂 I think I am more stubborn than patient! I am determined to keep trying at things until they turn out how I want them to. 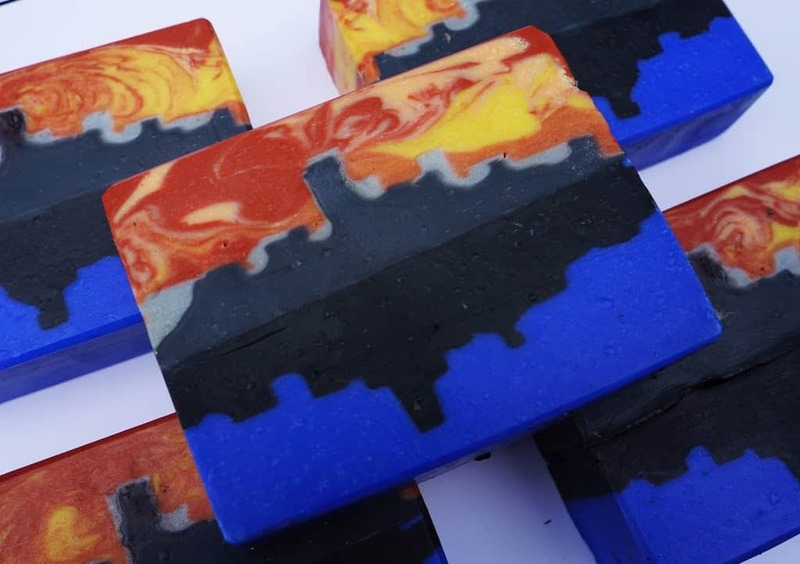 This soap had me up late into the night and I was so tired I made one part with only half the lye I needed so I had to him it and start again! !